The Magnetic Dry Erase Whiteboard can be widely used in home, office and school for memo, meeting, teaching and so on. 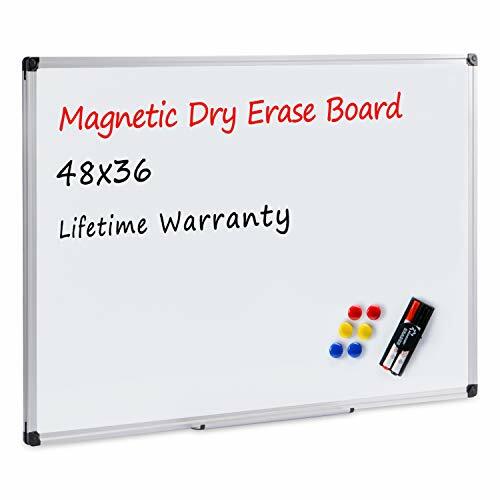 Anti-scratch magnetic dry erase writing surface is smooth and durable and is also easy to dry and suitable for all dry-erase markers, can be used to write messages, pictures, memos, and so on. A removable marker tray can be adjusted on any side of the whiteboard to facilitate the placement of the writing material. Here are two ways of hanging: You can fix the whiteboard on the wall through four holes on the corner of the board. You can also hang the whiteboard anywhere you want to hang by the movable buckles. Board2by is a professional manufacturer of high-quality whiteboards, produce thousands of board products every month, from magnetic whiteboard, melamine whiteboard, blackboard, fabric board, cork board and so on. Each of our products is carefully manufactured and tested every day. Board2by keeps bringing best quality to customers all over the world! If you have any questions about this product by Board2by, contact us by completing and submitting the form below. If you are looking for a specif part number, please include it with your message.